Alt-right demonstrators protested Libby Schaaf on Sunday. 1. 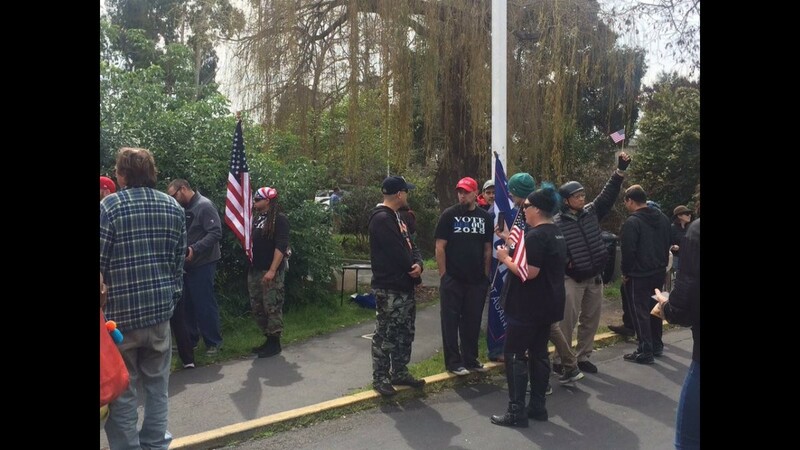 Alt-right demonstrators on Sunday protested Oakland Mayor Libby Schaaf and a Fruitvale cafe that is refusing to serve uniformed law enforcement officers, reports Lisa Fernandez of KTVU. The protesters, who described themselves as “patriots,” first demonstrated outside of Hasta Muerte coffee shop in Oakland’s Fruitvale district, before heading to the Temescal Farmers’ Market to target Schaaf, who was holding a “mobile mayor” event. The demonstrators protested Schaaf’s decision to issue a public warning about immigration sweeps. 2. A broken storm line in Oakland created a large sinkhole that forced the closure of the Posey Tube on Sunday and Monday, creating traffic backups in Alameda, the East Bay Times$ reports. Crews were able to keep one lane open during this morning’s commute but planned to close both lanes after 10 a.m. The Posey Tube runs from Alameda to Oakland and serves as a major commute corridor during the morning hours. 3. Two Alameda high schools were hit with more racist graffiti and threats of violence, reports Aaron Davis of the East Bay Times$. Vandals scrawled anti-Muslim hate speech at Alameda High School that also threatened violence. And Island High School was targeted with a violent threat, prompting a shelter in place. Alameda police are investigating the Alameda High incident as a hate crime. 4. Weather forecasters say Northern California is expected to be slammed by an “atmospheric river” storm this week that could dump up to 5 inches of rain in certain areas. The big warm storm is expected to produce about 3 feet of snow in the high elevations of the Sierra — above 8,000 feet. But even with the recent wet weather, the Sierra snowpack is still only 40 percent of normal. 6. And President Trump attacked special prosecutor Robert Mueller in tweets over the weekend, raising concerns that he might fire the man investigating him. Late Friday, Attorney General Jeff Sessions fired Deputy FBI Director Andrew McCabe, who Trump had attacked mercilessly on Twitter.